Are You up for a Woad Road Trip? Decor Tours, an interior design experience and educational event company of which I am co-founder, is excited to announce the launch of “Woad Trip,” a four-city tour which brings the ancient woad dye process to the U.S. under the direction of world-renowned French woad expert Denise Siméon-Lambert. We’ll be holding workshops on the woad dyeing process in Chicago, Philadelphia, New York and Boston throughout July 2018. The day-long events will start with an overview on the history of woad and demonstrations, the dipping technique, then the rest of the day will be spent dyeing. 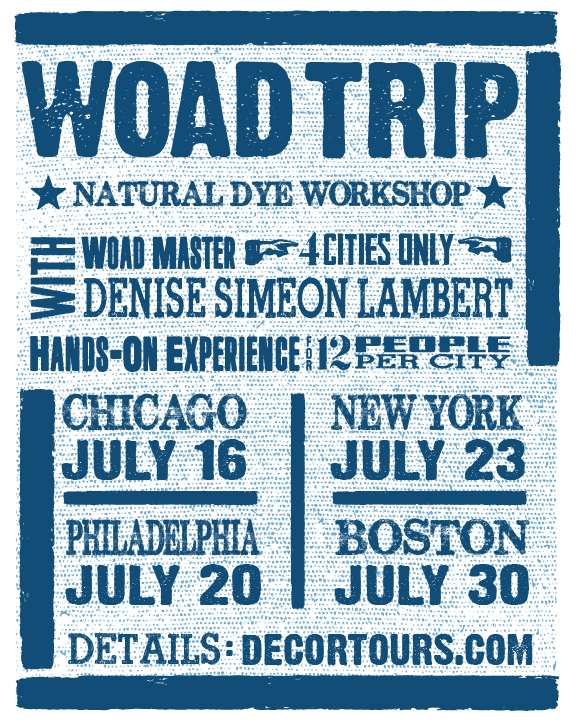 Each Woad Trip workshop will be limited to 12 participants, to allow for personal, hands-on instruction. Woad, a native European plant that produces a blue dye, was prized for centuries, but fell out of use once easier-to-use indigo exports from India became available starting in the 17th century. Siméon-Lambert began researching woad in 1994 and, through patient testing, developed a modern version of the traditional woad vat dyeing. This luminous, ancient blue has since caught the eye of fashion houses such as Dior and Chanel, designers in Japan, museum conservators, and others who admire the color as being distinctly different from indigo.